American Culture Critic: FOREIGN BODY: "The Foreigner" Is A Taut Thriller Buoyed By Strong Performances. FOREIGN BODY: "The Foreigner" Is A Taut Thriller Buoyed By Strong Performances. As you may or may not be aware, Jackie Chan was awarded the honorary Oscar in 2016 for his 56-year-long body of work (beginning at age six!) and spanning over 200 films; an achievement arguably long overdue. However, the honorary Oscar has historically carried the stigma of the recipient’s career either winding down or being on it’s last legs (as Peter O'Toole once famously remarked on his refusal to receive one). Regardless, he was all gratitude for having received. Yet, despite that honor, the international one-man entertainment industry continues his quest to earn another one on the strength of his acting chops if "The Foreigner" is any indication. The film, produced by (along with a myriad of others) and starring Chan (based on the book "The Chinaman" by Stephen Leather, adapted for the screen by David Marconi), and directed by Martin Campbell (The Mask of Zorro, Goldeneye, Casino Royale) is not your standard Chan vehicle. Believe me when I say this is a good thing. The film centers on Ngoc Minh Quan (Chan), a restaurateur in London. When his daughter Fan (Katie Leung, the Harry Potter films) is slain in a terrorist attack attributed to a group called "The Authentic IRA", a grief-stricken Quan goes looking for answers. 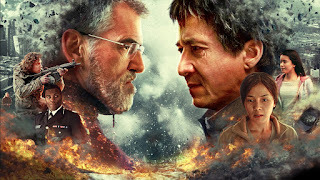 When his inquiries are rebuffed and himself dismissed as an old, unassuming Asian man, he proves to be anything but as he embarks on a quest for answers on his own; going so far as to challenge Irish deputy minister, and former IRA leader, Liam Hennessy (Pierce Brosnan, Goldeneye, The Tailor of Panama) for the truth. Director Campbell emerges from a six year sabbatical (after the poorly-received Green Lantern) to direct this taut thriller and evincing a true return to form. His pacing strikes a healthy balance between action and suspense, understanding that a mastery of the latter heightens the former. Unlike other films in his filmography, however, there is little in the sense of fun here. Campbell goes for a stark, dismal tone that befits the subject matter, which is unfortunately all too topically relevant. Campbell and cinematographer David Tattersall establish this at the outset visually, presenting the city of London and the vistas of Ireland through an overcast, bluish shroud at times reminiscent of Mel Gibson’s Payback (though shot in beautiful panorama at times, quixotically highlighting the beauteous Irish landscape despite its dreary climate). The sun doesn’t shine in this world; an apt metaphor for the emotional state of not only its central character , but also to the secondary players in varying degrees. Cliff Martinez’ score also adds to the oppressive, almost funereal cinematic tableau without drowning in it. But Campbell’s major achievement here is eking out remarkable performances from his two leads. Most Americans remember the cherubic, lithely athletic, self-deprecating Chan from films like Rumble In The Bronx, Supercop, or the Rush Hour series (or Cannonball Run, if you want to go that far). In this film, Chan's transformation is nothing short of astounding; his cherubic features worn and body weighted with age and heart-rending grief. There is nothing sprightly or comedic in this performance, which makes it all the more pronounced and startling. Chan's always been a performer, but rarely do American audiences see him as an actor. It's a jarring yet remarkable transformation that adds extra gravitas to the movie, but it’s an effect not limited to his physical appearance. Chan's fight scenes have always been extolled for their balletic skill as much as for their comedic bent. Here the fight choreography is among the most gritty (though still somewhat over the top) ever presented in his filmography even if the proof of his newfound use of stuntmen is unfortunately present. While still super-human in execution, there's a slower aspect to it, befitting a character in that stage of life. While Chan has always been a self-deprecating cinematic presence, for the first time he evinces a different type of vulnerability that really sells this role. Yet, despite Chan's name being above the credits, the bulk of the weight is equally carried on Pierce Brosnan's shoulders. Reunited with the director who helped introduce him to the world as the fifth James Bond, Brosnan arguably gives the performance of his career. His Hennessy is a confluence of contrasts, leaving the viewer unsure regarding their sympathies. Yet he also gives a measured performance, by turns subtle and explosive. Ironically, his native Irish brogue sounds exaggeratedly affected at times, but it adds to his character's charismatic nature. Over the years, Brosnan has grown as an actor, and that growth seems to culminate here. Yet both actors are at their best when paired off with each other, the one feeding and bringing out the best in the other. While the other actors acquit themselves, particularly Orla Brady (Into The Badlands), Michael McEllathon (Game of Thrones), Charlie Murphy (Philomena), and Dermot Crowley (Return of the Jedi), Chan and Brosnan are the real performances to watch, both independently and together. The Foreigner is a risky film that is better than it has a right to be. It’s tight, suspenseful and, despite its depressing tone, satisfying in all sense of the word. The true hallmarks are the powerful performances from its two leads. Brosnan gives the performance of a career, while Chan’s own is nothing short of revelatory. While the idea of Chan as dramatic lead may be a foreign one, this film will change that. Get out your spy glasses...The Foreigner is one to watch.